When Dr. Tappmeyer opened the Wright City Veterinary Clinic in 1978, he found that practicing veterinary medicine at his own clinic was similar to what James Herriott described in his books, including "All Creatures Great and Small." "The people and the medications (in the books) were different, but the personalities and the situations were similar," Dr. Tappmeyer said. "In my early years, West St. Louis County was all rural. By my high school days it was all suburbia. I am one of the few veterinarians in the area that has a farm background," Dr. Tappmeyer, who grew up in Creve Croeur, said. "We had mules, cows, hogs and chickens." In high school, he shadowed two veterinarians at County Veterinary Hospital in St. Charles. During his undergraduate studies at the University of Missouri, Dr. Tappmeyer was accepted into the veterinary program in his sophomore year. He graduated with his Doctorate of Veterinary Medicine from the University of Missouri College of Veterinary Medicine in 1974. He was the recipient of the Ebert Award for Outstanding Equine Student. Today, Dr. Tappmeyer is a member of the American Veterinary Medical Association, the Missouri Veterinary Medical Association and the Greater St. Louis Veterinary Medical Association. With three grown children, Dr. Tappmeyer and his wife Cheryl now share their home with a variety of pets, including their dogs Mr. Bud and Buddy Jr.; sister cats named Wrinkles and Waffles; Pedro, a rescue donkey; and JR, a mini-donkey. He is an active member of the Friedens United Church of Christ, an assistant troop leader with Boy Scout Troop 22, and a volunteer at the Independence Center Fishin' Mission. He enjoys farming, hiking, camping and vintage tractors. The second veterinarian to join the staff at Wright City Veterinary Clinic after Dr. Tappmeyer opened the facility was Dr. Schmittel. The clinic opened in 1978 and Dr. Schmittel began in 1979. After studying agriculture (and earning his undergraduate degree) at the University of Missouri in 1971, Dr. Schmittel received his Doctorate of Veterinary Medicine from the University of Missouri College of Veterinary Medicine in 1976. Today, Dr. Schmittel has professional interests in general medicine and soft tissue surgery. He is a member of the American Veterinary Medical Association and the Missouri Veterinary Medical Association. Dr. Schmittel and his wife Joan have four grown children and they share their home with a Beagle named Bailey and three cats, Maddie, Freckles and Garfield. Dr. Thompson has had a long association with the doctors at this hospital. "As a pre-veterinary student, I used to ride on large animal calls with Dr. Tappmeyer. Later, I would help Dr. Schmittel and Dr. Tappmeyer on weekends when I was in veterinary school. I got to know them very well, and am fortunate to have worked with them as partners and friends for the past 30 years," he said. Dr. Thompson joined the clinic staff in 1981. A native of St. Charles, Dr. Thompson attended the University of Missouri at Columbia, where he earned his undergraduate degree in agriculture in 1977. He later attended the University of Missouri College of Veterinary Medicine and received his Doctorate of Veterinary Medicine in 1981. While there, he was the recipient of the Dr. English Award. 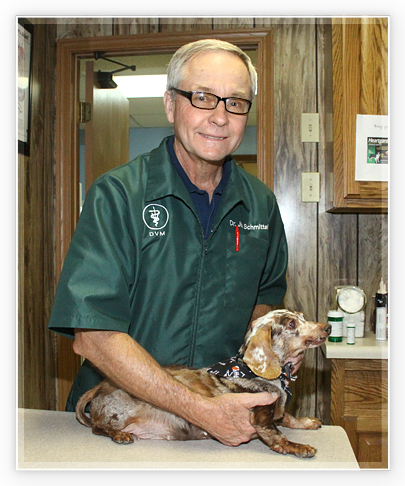 Today, Dr. Thompson performs the majority of surgeries at the Warrenton Veterinary Clinic. 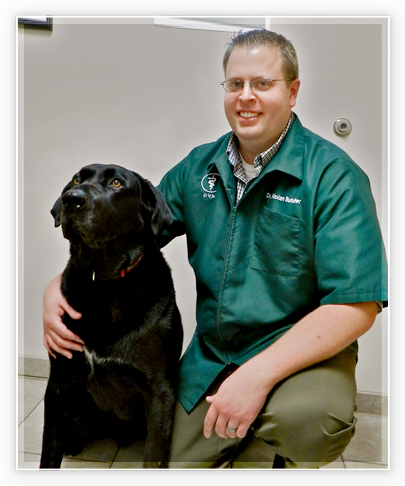 He is a member of the Missouri Veterinary Medical Association and the American Veterinary Medical Association. Dr. Thompson and his wife Carol raise miniature donkeys on their farm, Thompson's Field of Dreams. All the newborn babies born on the farm are given "baseball" names. Dr. Thompson enjoys hunting, fishing, hiking and is an active member of the Holy Rosary Athletic Association, where he helps organize the organization's four annual basketball tournaments. 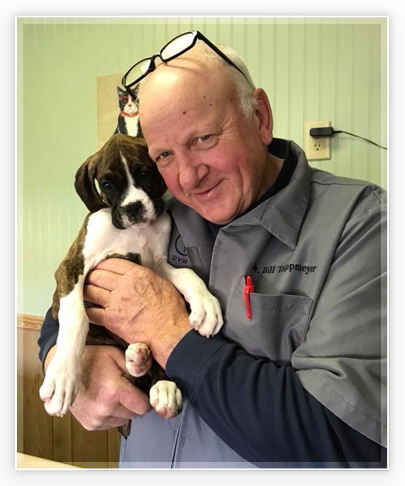 After 30 years of being a veterinarian, Dr. Lenzenhuber said he is still motivated by the "interesting animals and people I meet daily, along with the satisfaction that comes with helping both." Originally from Warrenton, Dr. Lenzenhuber studied at the University of Missouri, Columbia and was accepted directly into the College of Veterinary Medicine in 1978, where he earned his Doctorate of Veterinary Medicine in 1982. A member of the American Veterinary Medical Association and the Missouri Veterinary Medical Association, Dr. Lenzenhuber began practicing at Warrenton Veterinary Clinic in 1984. Dr. Lenzenhuber and his wife Rosie have four dogs, Daisy, Petey, Merlot and Norton and three cats: Walter, Billy and Jasper. He relaxes by playing golf, gardening and fishing. Dr. Jill has had a lifelong love of animals. Years of volunteering at the Humane Society of St. Louis when she was young was her first experience with helping pets. Since then she has gained 20 years of experience working in veterinary hospitals. Working through college as a receptionist and technician at a busy small animal hospital in St. Louis, she realized veterinary medicine was her future. "After being part of that team, I knew that being a veterinarian was the only career option for me. I wanted the daily challenge and reward of working with people and their pets." She received her undergraduate degree in Biology from St. Louis University. She went on to earn her Doctorate of Veterinary Medicine from the University of Missouri - College of Veterinary Medicine in 2004. 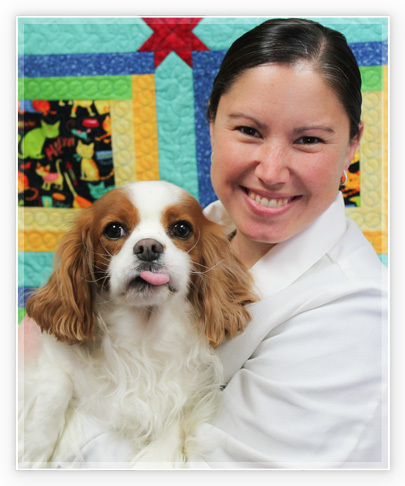 She practiced in Troy and Wentzville before joining the Wright City and Warrenton Veterinary Clinics in 2007. Dr. Jill is a member of the American Veterinary Medical Association with a special interest in feline medicine and the human-animal bond. She and her husband Kent, have 2 children and a dachshund and live on a small farm in Troy. There, they keep a big garden, raise chickens, and enjoy fishing. She also enjoys reading, scrapbooking and crafting. She has been happy to be welcomed into the warm hometown atmosphere of Warrenton. Her family attends St. John's Lutheran Church, her children go to Holy Rosary School and the entire family is involved with Warren County 4H. 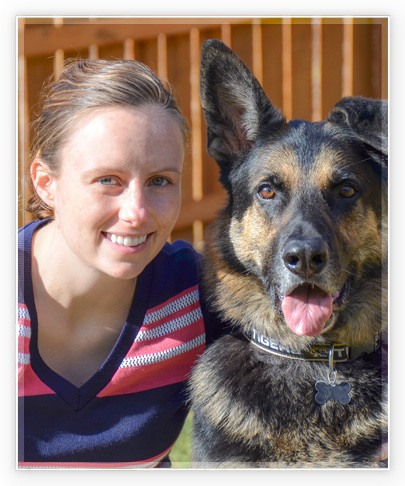 She looks forward to continue to build relationships with the people and pets in our practice. A native of Warrenton, Dr. Butcher began his studies at the University of Missouri-Columbia and earned his Doctorate of Veterinary Medicine from the University Of Missouri College Of Veterinary Medicine in 2012. While there he was named to both the Dean's List and Honor's List. Dr. Butcher has professional interests in surgery, orthopedics, and dentistry and is a member of the American Veterinary Medical Association, American Animal Hospital Association, and the Missouri Veterinary Medical Association. Dr. Butcher and his wife have two daughters Caitlyn and Claire. They share their home with three dogs, Drake, Charli and Jake. Jake is certified as a Canine Good Citizen with the American Kennel Club and is a therapy dog. Outside of the clinic, Dr. Butcher enjoys hunting, fishing, and playing sports. 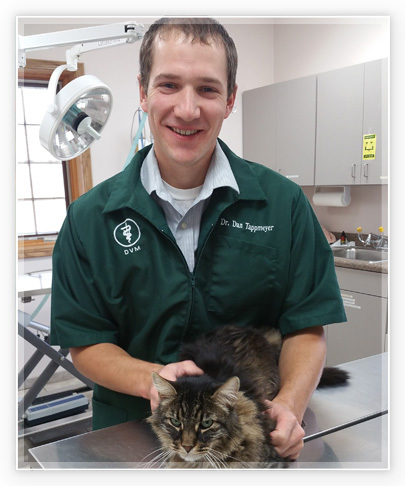 Although Dr. Dan Tappmeyer is the most recent veterinary graduate at the Warrenton and Wright City Veterinary Clinic, he has a long history in the practice. As a child he spent much of his time at the clinic and riding on farm calls with his father, Dr. William "Bill" Tappmeyer. During high school Dr. Dan worked at the Warrenton and Wright City Veterinary Clinic as an assistant before attending the University of Missouri. He joined the team in 2013. "I was always asked if I was going to become a veterinarian like my father, and growing up my answer was always, "'No,'" explains Dr. Dan. "However, as I got older I realized how rewarding it was to be able to help people and their animals which caused me to reconsider." 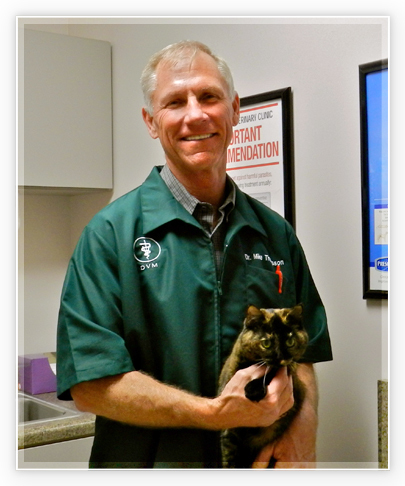 Dr. Dan earned his Doctorate of Veterinary Medicine from the University of Missouri in 2013. 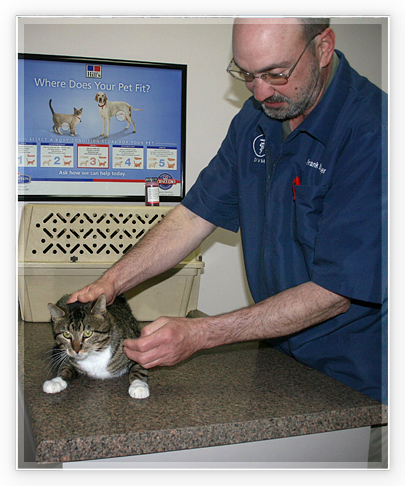 Dr. Dan enjoys large and small animal medicine and he spends part of his time doing mixed animal practice at the Hermann Veterinary Clinic. Dr. Dan and his wife, Ashton, have one child, a daughter born in 2015, and share their home with two cats, Sophie and Lily. Dr. Dan enjoys working on his family's farm, home improvement, and spending time with friends and family. Michelle Butcher is a small animal veterinarian. She graduated from the University Of Missouri College Of Veterinary Medicine in 2012. Since that time, she has gained valuable work experience at the Animal Emergency Center in Collinsville IL and the Animal Emergency Clinic in O'Fallon MO. She is married and has two daughters. In her free time, she enjoys camping and hiking. She also loves spending time with her daughters whose special interests include coloring, blanket forts, and bug hunting.